So today on my way to have my first dress fitting in Williamstown I passed about 6 fresh fruit stands. 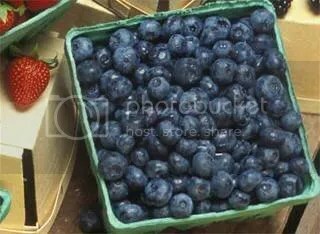 I couldn’t help but remember all the posts from fellow blogger, Holly, about Jersey fresh blueberries and how delicious they are–not to mention loaded with antioxidants and lets face it I’m determined to eat healthy and drop another 5 or so pounds before my wedding in August. So i stopped at a local produce market and bought fresh blueberries, peaches, bananas, and a watermelon for myself and my family. Can’t wait to cut them all up and start making some yummy snacks. Recipes to be posted later!